I’ve made a disastrous mistake. 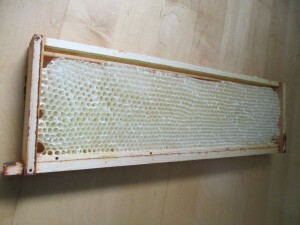 During honey extraction I put aside some very good-looking frames for cut-comb. Storage was a bit of an issue, but I decided to put them in a super inside a cardboard box. The box was put in the spare bedroom, a north-facing room with no history of bee invasion (you can see where this is going!). A small window was left ajar and the cardboard box wasn’t quite bee proof. This storage worked as expected for a couple of weeks and I took out frames for cut-comb as required. Then after a two-day gap when I didn’t enter the bedroom, I went to retrieve another frame and found the room alive with bees! In two short days a bee or two had somehow discovered the slightly open window, found the slightly open box and taken a sample. (The weather was quite cool, so the enticing smell of the honey was certainly not apparent to me.) The investigatory scouts had then gone back to tell their relatives of a poorly hidden honey hoard. In less than 48 hours, a golden throng had decimated four frames (one remained intact — I know not why). Sadly some bees died in the exercise as they couldn’t find the small top window exit to take away their plunder. The bees investigatory and communication powers had made a fool of me in less than two days. I won’t be making that mistake again. 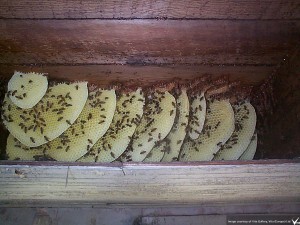 Feral honeybee colony. Photo: Julie Lake. Could feral colonies be a reservoir for varroa-tolerant bees? New research in Plos One suggests not. Abandoning Varroa treatment could leave colonies dangerously exposed, say the researchers. Anecdotal reports have spoken of a recent resurgence on feral honeybee colonies and the hope that they may be resistant to Varroa, but new research does not support those hopes. It indicates that feral colonies in the UK have similar profiles of viruses to managed colonies, and that the feral colonies contained a significantly higher level of Deformed Wing Virus (DWV), the virus that is often lethal to the colony. Rather than being a distinctive genetic group of honeybee colonies, the research thought that the feral colonies were probably simply escaped swarms from managed colonies. Untreated “managed” colonies closely resembled the virus profile of feral colonies in many ways. What has happened? Beekeeping has become trendy! 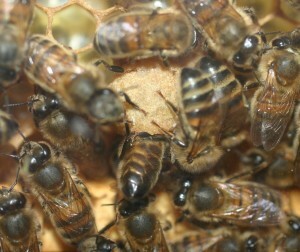 In Britain World War II and its aftermath saw a huge surge in beekeeping. rationing was the cause — or rather the government’s granting of extra rations of sugar to beekeepers because honey (and presumably pollination) was regarded as such an important foodstuff. rationing ended in 1954 and there began a dramatic fall in the number of beekeepers in the UK. The 1970s saw something of an upturn as interest in self-sufficiency grew, but when the varroa mite arrived in the early 1990s, many, especially older beekeepers found the mite and the need to radically change management techniques too much of a challenge. Again lobbying of government by the BBKA played a large part in raising the profile of honeybees in government, with the media and amongst the general public. Beekeeping is on the rise again! 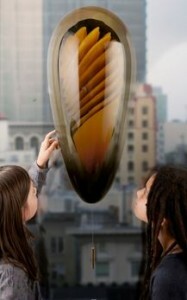 There’s even a designer urban hive allegedly in the works. Even virgins attract an entourage – for a while. It hasn’t been all plain-sailing in the observation hive this summer. The first queen swarmed, the second queen seemed to disappear on her mating flight, but we now have a third having given the colony a frame of eggs and larvae to work with. They say that small colonies won’t produce good queens and I don’t doubt this as a general rule, but this one is looking just fine though she hasn’t mated yet. She became easily visible two days ago, but over the past 24 hours she has become very hard to find. 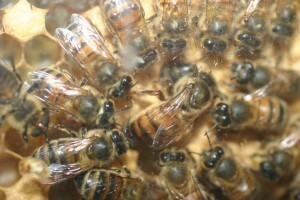 last year, the struggles of a virgin queen around the colony were obvious. And now the new queen in the hive has exchanged an entourage for a barrage of bees. It seems that the bees may now becoming impatient for her to go on her mating flight/s and are making life uncomfortable in the hive until she does. But here’s a curious thing: even though she hasn’t yet mated, she is going through the motions of egg-laying. I noticed this with the first queen that swarmed too. The egg laying motion would seem to be a hard-wired action from birth. The queenless observation hive is working hard to become queenright. 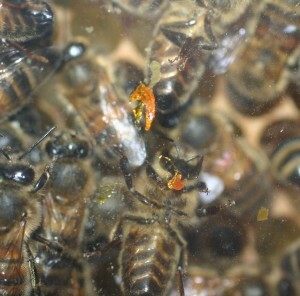 Here’s one queen cell being created, but I bet there are others! Meanwhile, the mystery of the queenlessnes seems to be becoming clearer. (See the previous blogpost for the full mystery. My neighbour has just informed me that just over one week ago he’d noticed bees clustering around the tube entrance of the hive late one evening. That is unusual. It was warm, but not that warm and the end of the tube is about 60cm from the hive itself. So it was hardly to alleviate the heat. It would seem that that’s the day the queen left on her mating flight. I guess that the bees waited outside for her until late in the evening, but she never returned. Meantime, the observation hive glass is being cleaned up after a messy bee left propolis all over the glass!